What is the Pixel Log? The pixel log is located under the main Channels > Pixel Log subtab. 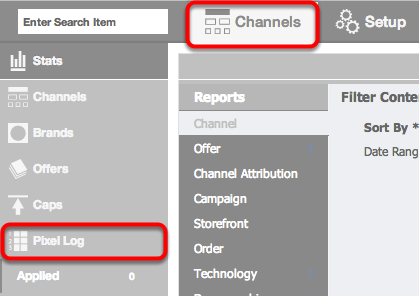 The report includes filters for: Brand, Offer, Active/All Status ('Hide Inactive Offers' checkbox), and Date. The default will be all offers for the current day, but this can be adjusted. Global Brand Pixel: Is the pixel a global Brand pixel? Green if yes, Red if no. When you click on the hyperlinked 'Attempted' number, it will open a new tab with the pixel log for that specific offer. Conversion Pixel Not Allowed On CPM Offer: Conversion pixels are not used or needed for impression tracking within CAKE. Conversion Stored: The pixel fired properly and CAKE tracked the conversion. Cookie/Session Not Found: The pixel fired, but CAKE did not find a Cookie or Session to connect it to a particular click or user. Duplicate Transaction ID: CAKE has already received this Transaction ID on the postback. Offer Not Found: The pixel fired but CAKE did not find the Offer it is tied to; the Offer may have been deleted. Pixels Fired After CPC: CPC price formats do not require a pixel fire for the conversion. CAKE will ignore this pixel fire. Pixels Fired After Lead Submission: On Hosted and Host-n-Post Offer Types, CAKE needs the lead prior to calling the conversions pixel. This disposition is acknowledging that the conversion pixel was sent correctly. This would be used to call an affiliates pixel only. Pixels Fired On Postback Fallback: CAKE stored the HTML pixel and categorized it as the fallback since it was fired after CAKE stored the conversion from the Postback. Step Conversion Stored: The Step pixel was fired and CAKE stored that particular conversion. IP Over Max Connections Per Second: This means the same IP address has sent multiple conversion pixels over the threshold. If this occurs, the IP needs to be whitelisted via the pixel whitelist tab.